Have any of the v8 swaps improved over the past few years, or do we still have driveaxle problems and partial developed kit problems? I'm shocked no one seems to have completely figured it out yet. I hope I'm wrong though, my 2.5 can't be all that long for this world. A few guys have done a 4.2L swap but there hasn't really been anything that well documented. I'm not a fan of the LS swaps. I'd rather not hack the car up to fit the engine in. I'm fine hacking it up, I just need something durable enough for the track. It sounds like the options out there don't have a solution whiteout a weird driveshaft angle. ...that Corvettes are available on the open market. I have three audi 2.7T motors sitting in my shop. I wish I had the time to put one of those in a boxster like that guy in England. The Audi 2.7T can make gobs of power for cheap. Wouldn't mind trying a VR6 too. I think that there just isn't a good enough pay-off for anyone looking to develop an actual kit. Most of the market to replace failed engines in an old Boxster is probably more of a budget buyer. Making it all well takes skill, time, and money. Round up 30-50 buyers (investors) with $10K each and turn John (BoxsterLs376) loose with it. Check out what he said near the end of this post: http://986forum.com/forums/535558-post510.html I bet it would be 'bolt-in' within 6 months. I'm muddling through my own Audi 4.2 swap, but like most of the swaps I've followed , it is a start and stop project and isn't going to produce step-by-step instructions. ....just drop your Box off at Flat 6 and let Jake Raby build you an engine. I think that there just isn't a good enough pay-off for anyone looking to develop an actual kit. There simply isn't enough of a demand to supply a turn key "kit" for an LS-based conversion. Additionally, there's a significant amount of modifications to the body, wiring and cooling system that no kit would ever would ever be able to provide a true bolt-in solution. Bottom line, if you're not comfortable cutting / welding / soldering, then the LS swap is not in your best interests. The Audi V8 swap, however, could be a different story. This engine has the highest possibility of a bolt-in solution. I'm almost willing to bet it could be done without modifying the firewall. However, you need to remember the audience in all this. The typical individual looking at performing a V8 swap is anticipating DOUBLE the power output of the original engine (500hp vs. 250hp) While the Audi "could" be a more simple swap procedure, it's simply not going to achieve the same power levels as the Chevrolet design... as least not at the same cost break. Finally, I enjoy not having a good kit available. It makes my car a little more unique. I've been researching this swap for over a year now. 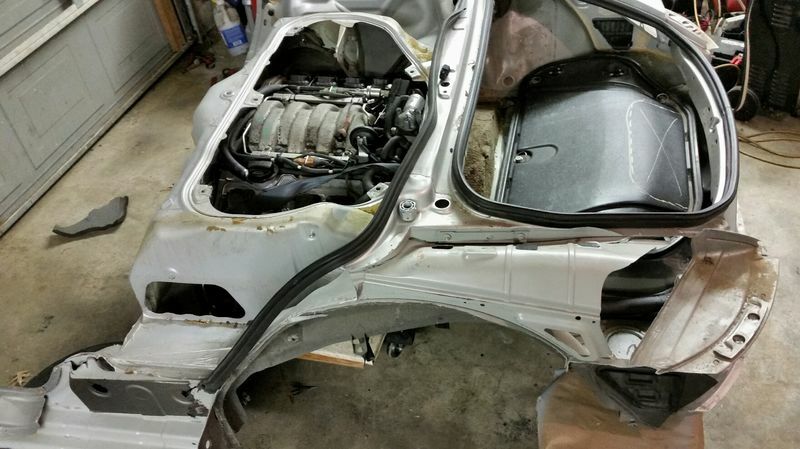 My goal would be to achieve factory-like integration with no cutting or irreversible modifications done to the Boxster. I think the minimum requirements to swap an Audi V8 into a non-S (5-speed) Boxster you could get away with would be an engine cradle, and a conversion harness between the Audi engine and the Boxster body harness. Obviously air, exhaust and coolant plumbing as well. You likely wouldn't need to cut up the car anywhere. Based on the measurements I've seen the belt drive V8s aren't any longer than the M96s when measured from the crank pulley back to the transmission mounting flange. The chain drive V8s (i.e. B6 S4) would be less so (but there are issues with those engines). 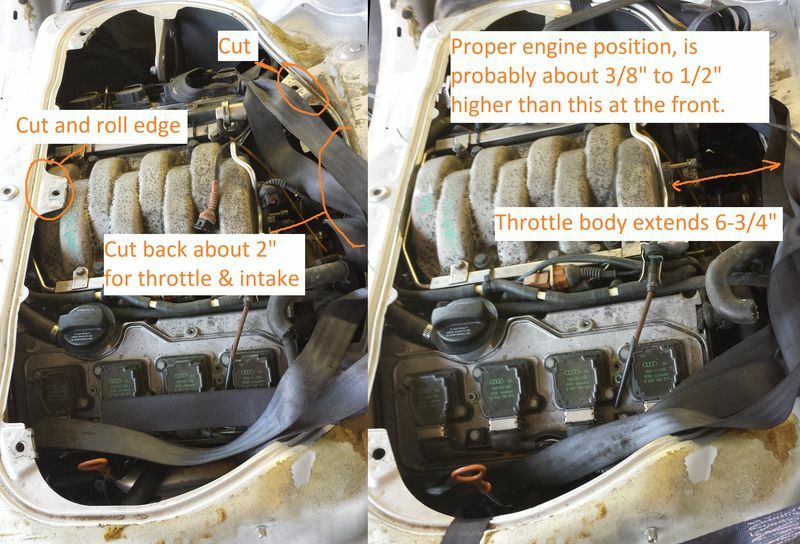 The issue is with the height of the engine which causes an interference between the engine cover and the throttle body... at least based on the pictures I've seen on the interweb. There are probably communication issues between the body ECU and the engine ECU that would dictate the use of arduino based signal conversion modules to ensure functions like the PSM and the speedometer work. However, both are Motronic based to begin with at least, which is more that you can say for the LS engines, so there is a likelihood that these are non-issues depending on which year Boxster and year V8 you end up with (and what revision Motronic each has). When I swapped a 2.7tt into my B6 A4 (2003) the engine and body ECUs were close enough in Motronic versions that all functions worked just like factory. The car was smogged through the OBD port, traction control and stability control worked and controlled engine output accordingly, all speed sensors from the engine controlled the tachometer and vehicle speed sensors fed into the engine ECU properly.. The only thing that didn't integrate properly was cruise control, but I could have wired in an older control stalk to fix that issue. But I sold the car. If the V8 swapped into the Boxster in the same way it would be a piece of cake, but from what I've seen online so far, this isn't the case. If anyone in Ontario has a hoist and wants to do this to their car, I'll design the parts, get them fabricated, and do the wiring. You supply the V8 and the Boxster (preferably a later model 986). I can't afford to spend $20,000 to get 300hp out of my M96. Woah, nice find. Thanks for the intel. Heading down to the lab right now to steal a 1M resistor and 1uF cap. I've been working on a cradle/subframe lately. I'm not a good welder or engineer, so I have made a rough wooden model that I'm having a shop use for dimensions. To get an Audi V8 to fit with the stock intake it will need to have a little cutting around the engine cover. I'll post pics in a day or two. The throttle body is too high and too far back on both the ABZ and 40 valve engines. With mine there will be a little cutting and a custom fabricated all metal cover. The rest of the fit looks good. Unless I find problems as I progress I plan to keep the PS pump and AC compressor. 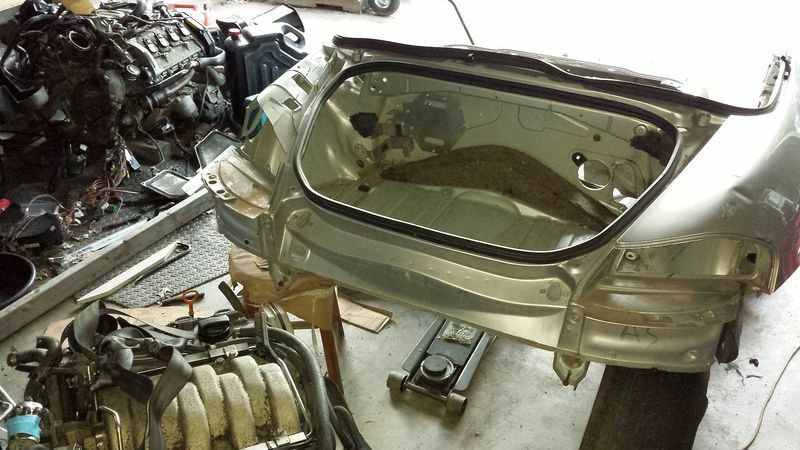 Lots of room at the front firewall and a little play at the bottom end, oil pan, subframe. My positioning is based on mounting the transmission to the engine, then mounting the transmission normally in the car. The 40 valve, electronic-throttle engines fit about the same. The Audi motronic 7.1.1 ECUs are pretty easy to reflash (for the 40 valve engines), but so far I have not found a good version (freely available) for the manual transmission on the A8 ECU. The info needed to create it is available through NefMoto and as I get my engine running in the Boxster, I'll figure out exactly what changes need to be made. What year Boxster? Do you have the wiring diagrams for the V8? ABZ code, right? The way I look at it is that you need to re-do all the plumbing for the 2.7tt when you swap it into the 986... so you might as well start with a V8! There's apparently a manual transmission V8 file from the euro S8 floating around Nefmoto somewhere. I think that's the one you need. I'm assuming your Box is DBC? My project car is a 2000 S. At first, I was going to go with the ABZ, then I bought a complete 2003 A8. I think that for the 2000 and later cars the 40 valve engine is the better match, so that's probably what I'll go with. I have seen the Euro S8 file and I really need to see if one of my ECUs will take it without bricking. From what I have read though the tune will be off pretty bad due to differences in intake and valves etc. My 2000 S is still intact and driveable (with a 2.5L engine that seems to have a blocked coolant passage). I have the cut-away back end of my parts car for a mock-up. There are a lot of versions of wiring diagrams scattered across the web. I collected everything I'd need for the ABZ, and had mapped out much of the harness. Now with the change of plan, I have a Bentley for the C5 (AWN & ART engine code) - not quite a match for my late D2 AUX, but close. Last edited by 78F350; 06-06-2017 at 05:36 PM. would it be easier to just fabricate a smaller sump (or a dry sump) and mount the engine a little lower in the bay and avoid the cutting, etc.? I have never fabricated a sump. I have cut up cars. For me and for a car that will not be going back to an M96, cutting is easy. Weld on a little reinforcement or bolt on rear strut bar if I cut into structure. Can the Audi V8 be made to fit without cutting? I think so. Look at what Kent (Kcpaz) did with the custom intake manifold and front mounted throttle body. Beautiful engineering. If you drop it much lower, I think the transmission will have to be mounted lower as well. The height of my engine placement is based on standard mounting of the 5-speed transmission. What I like about the Audi 4.2L and 2.7 tt swaps is that they bolt directly to the unmodified transmission. Here's a pic of what I was hoping for before I bolted the transmission on. It almost fit other than the IAC valve. I take it the 6speed doesn't easily mount to any Audi V8 engine or are we only working with 5spd boxes because that's what we've got to play with? I believe the 987.2 and later 6 speeds bolt up with no problem and have a spot for the starter much like the 5 speed. They are supposedly stronger and lighter than the earlier 6 speeds. Of course those transmissions are $2500+ right now and demand is high for them. I could probably sell 10 of them if I had them. All the WRL guys want them. Another motor I haven't heard much mention but is actually a better motor than the 2.7 and possibly 4.2 is the VW VR6. The VR6 is a beast once you throw a turbo on them. The rumor i heard was that the VR6 was designed to be a diesel motor originally but then was switched over to run gas. Because of it's diesel dna, the block, crank and rods are super strong and can handle lots of boost. I'm thinking it's height might be a problem in a boxster as it's almost an inline six. That could also be a good thing as there would be more room on the sides for turbo plumbing. A turbo'd VR6 is also one of the best sounding motors ever. The VR6 was the base motor for the cayenne.